yes. you read that correctly. foodie friend and co-worker, Andrea (over at Storming Your Castle) and i were talking about food — probably because i was either a) hungry, b) didn’t know what to make for dinner, or c) both — and we got on the topic of pizza. 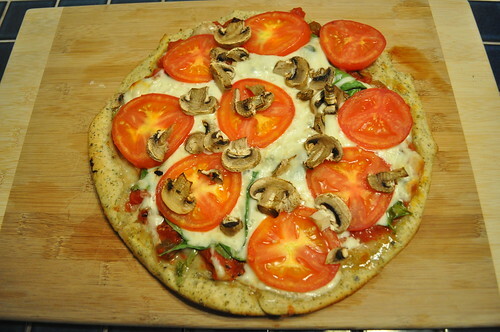 Andrea informed me of her post where she made pizza… but with a cast iron skillet! i was shocked, baffled, intrigued and way excited to try it out for myself. if you want to try a deep dish style pizza (or are unsure of yourself like i was), make the pizza inside of the pan. 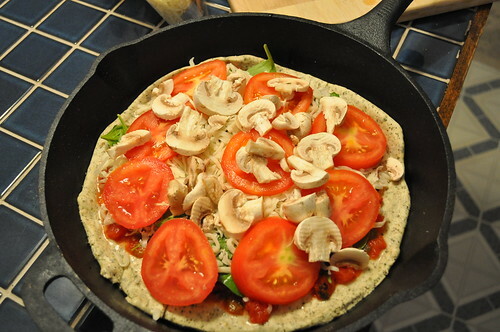 if you’re going for more of a thin crust, flip the skillet over. i threw caution to the wind and went at this with more excitement than anything else. i went to the grocery store after work and got some dough, diced tomatoes and cheese. i knew i had some random things i could toss on the pizza back home, so i was going to cross the topping bridge when i got to it. i pre-heated the oven to 400 degrees but i did not put the skillet in the oven. no point in messing with a heavy hot skillet (another great tip from Andrea). i looked at the dough and realized… i didn’t have a rolling-pin! seriously?! i know, right! but the last time i made a pizza was when i had a roommate who had a rolling-pin which was over a year ago. i surveyed the kitchen and while i hate to admit it at first, i’m kind of proud of myself for my quick thinking. i was enjoying a beer in a bottle so i poured it out, cleaned the bottle off well and used it as my rolling-pin. not glamorous but it got the job done. after rolling the dough out i put it in the pan. 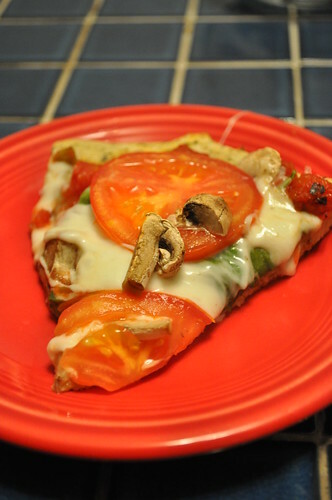 i used a can of diced tomatoes with some of the juices, tossed on a good handful or two of fresh spinach, a nice coating of mozzarella cheese, sliced mushrooms and sliced tomatoes. i popped that bad boy in for about 25 minutes and voila. amazing pizza. i have never made a pizza with such a crispy crust. and it was so DELICIOUS. it tasted just as good as it looks in the photos below. if you don’t have a cast iron skillet, i suggest keeping your eyes peeled for a sale at macy’s and get one. i picked mine up for $15 and it has been the best $15 i ever spent. it might be heavy but… look at what it is capable of doing! you bet i’ll be making more pizzas now. i’ll try not to bore you with them… perhaps a breakfast or dessert pizza?! hmm…. i’ll do both! 🙂 yum, yum and yum! i went to trader joe’s the other day set with making pulled chicken BBQ sandwiches. i left trader joe’s with provisions to make said sandwiches but also provisions to make a stromboli. the sandwiches had to wait for another night. 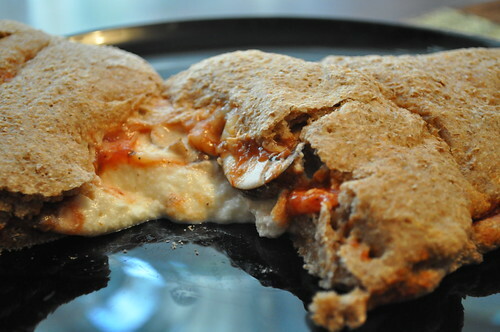 you can really use anything you want on the inside of your stromboli. i was feeling cheesy so that’s the route i took. pre-heat the oven to 375. roll out the dough but not too thin. spread the pizza sauce on the dough leaving a lip around the edge to seal later. add your ingredients that you want to put in your stromboli and seal. 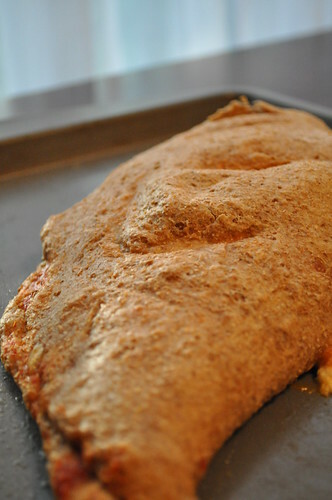 cut a few vents to prevent the stromboli from popping and place on a baking sheet. bake for about 15 minutes or until golden and everything is warmed through. serve up with a knife and fork and enjoy. easy, quick and delicious. that’s how i like it. yum yum! my friend over at bon chappétit made mexican baked chicken last week. 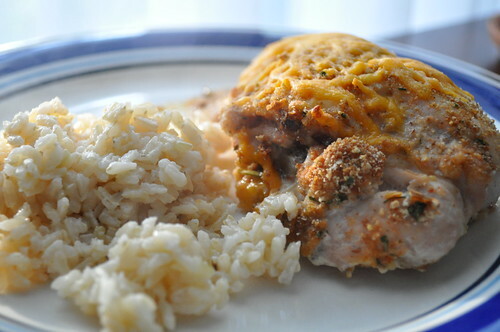 i read his post and quickly realized that i had everything needed so i thought, “alright, i’ll finally give one of his recipes a try.” here is my take on the mexican baked chicken. more so, mexican inspired baked chicken. pre-heat the oven to 350. butterfly the chicken breasts and spoon in the salsa, peppers, cheese and cheddar cheese. roll and secure with a tooth pick. combine the taco seasoning and bread crumbs and coat the outside of the chicken evenly. place on a greased baking sheet and bake for 30 minutes. add a smidge more of cheese on top and cook for an addional 5 or 6 minutes or until the chicken is done. i served this with some brown rice and the rest of my pico de gallo. bon chappétit really nailed this one. my house smelled delicious when the chicken was cooking – i couldn’t WAIT to eat this! it happily fed myself and i have a lot left over. the chicken was juicy, the veggies flavorful and the taco seasoning gave it just enough mexican inspiration.